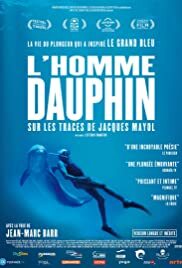 The title DOLPHIN MAN belongs to the legendary free-diver Jacques Mayol whose life became the inspiration for Luc Besson’s cult-movie THE BIG BLUE (LE GRAND BLEU) . The bio doc is narrated by Jean-Marc Barr who played Mayol in THE BIG BLUE. Free diving is as the name implies, diving deep into the ocean without any breathing aid. Lungs get compressed and without oxygen, if the diver faints, he or she will be unable to re-surface which implies certain death. Mayol is world famous as a free diver having broken his own records of depth free diving many times. 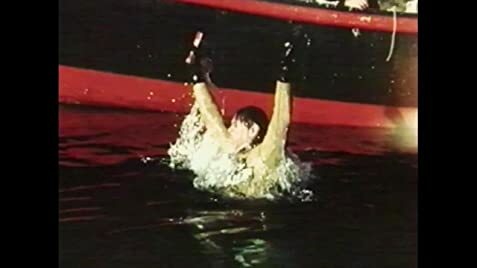 Mayol achieved fame in 1976 when he became the first free diver ever to descend 100 metres. This legend of the sport spent his life setting records and going beyond what was considered humanly possible. Charitos’s bio plays safe and covers all aspects of the diver’s life from his childhood, to his philosophy (of being one with the ocean), to his lifestyle and finally to the legacy he leaves behind. His childhood is narrated with archive footage of China. Mayol was born and lived as a child in Shanghai as his father was a French architect there. Mayol loved the sea and when he was old enough took off to travel the world. He married and settled in California with a Dane. They broke up. Before attaining fame, Mayol worked all kinds of jobs including the chauffeur of Zsa Zsa Gabor. (Wish there were shots of him and Zsa Zsa together.) But always broke, he used to stay at friends’s places for free. The title Dolphin Man comes from Mayol’s fascination of the mammal. He was nicknamed the French Dolphin by the Japanese. He preferred a world of dolphins without humans. In a way, Mayol has led his life similar to the dolphin’s. The film reveals Marol’s first sight of the creature while on a ship as a child. The bio finally rests on the diving. Mayol is shown in many segments, diving into the waters for various purposes – treasure hunting; lobster fishing or breaking new records. Chartos’s film diverts a bit to the subject of breathing, as breathing is an important element in free diving. His camera takes the audience to India to meet Yoga Masters that tag the wart of breathing or non-breathing. The film also diverts to other free divers who are also champions in the field. Every subject in a doc would have a downturn in his or her life. For Mayol, one downturn was the death of his true love Gerda. Gerda was the love of his life, loving the same things he loved like animals, eating the same food and sharing the simple pleasures of his life. Gerda died in his arms – though the reason is not given in the film. Mayol, described as a lolly man by nature, goes into deep depression as a result. Another time was when he was shooting a film when he descended the deep too quickly bursting an ear drum. The footage shows Mayol much older and obviously not the young athlete he was. Again, Mayol went into depression. Director Chartos uses Mayol’s depression to lead the film towards its sad conclusion that nevertheless provides the audience with some valuable insight on life – distinguishing DOLPHIN MAN from the run-of-the-mill bio documentary.